Why a good cuppa can give us the insights we need to understand how people experience government. In this blog, we look at user research on one of the federal government’s largest and busiest digital gateways, myGov. After the last round of improvements to myGov in May 2017, I spent four weeks talking to people about how they use the government’s gateway to health, tax and welfare services. I’ve had eight years in user research and service design but the sheer number of myGov users is rare. Where do you draw the line on who you talk to when the user group is most of Australia? Especially when we owe it to the taxpayer to keep costs down. The thing is government often has numbers-based data. myGov knows how its users do things online to a certain extent. But what numbers don’t necessarily tell us is how and why users do things online. And that’s where user research gives us the best insights. In the case of myGov, we came up with a plan to meet a really diverse group of people and learn from their experiences. Rather than ask people to come to a government office, we went to them. With a colleague from the Department of Human Services we hit the road, travelling well over 2,000 kilometres to regional, rural and city locations in four states. We spoke to people of all ages, stages of life and from different cultural and linguistic backgrounds. We also talked to government service teams that use myGov to access Medicare, Centrelink, the Tax Office and other services. We were there to work out if upgrades to myGov, including to its navigation and design, had changed things for users. Had they made things easier? The interviews we did are called contextual enquiries, a bread and butter technique for most user researchers where we get to know people and uncover the way they usually do things. In this case we asked people to do something on myGov that they were familiar with, then do something else they didn’t know so well. Being in their space means they use their own computer, tablet or phone, which helps them relax as we sit nearby and watch them do the task. Interviewing people at their home or work also gives us a much richer picture of the people we talk to. We have a set of questions to guide interviews but every conversation is different. It’s often the tangents people go off on that add a lot of value. Most of all we have to sit back, let conversation flow and hear what people want to tell us. The people we talk to in this way open up every corner of their lives so we experience more than just what they do online. We see cluttered spaces, hear worries about bills, notice the black spot in internet reception and other stresses and strains that change their experience. These details are so important for understanding the situations people are in when they use a digital service. Real life interviews with a broad group of users can make all the difference to how you go about designing and delivering digital services. For this myGov research we worked with the multicultural team in the Department of Human Services to come up with a diversity matrix — a tool to list the range of experiences out there and match them against the users we speak to. As a result, we talked to people with lots of different perspectives including business owners and people with different levels of employment. We spoke to older people and retirees on pensions, people with mental and physical health conditions, families with different make ups and care situations, people on welfare, people that live in public housing and more. What struck me again and again is there are so many reasons and situations where people need to use a government service. For example, we met with someone who had split up from their partner and used myGov to access child support and their disability allowance. We talked to a couple with a newborn where the mum had been seriously ill and needed the system for Medicare. We met a husband who uses myGov to access disability services for his wife, after a chronic illness forced her to stop working and him to become her carer. 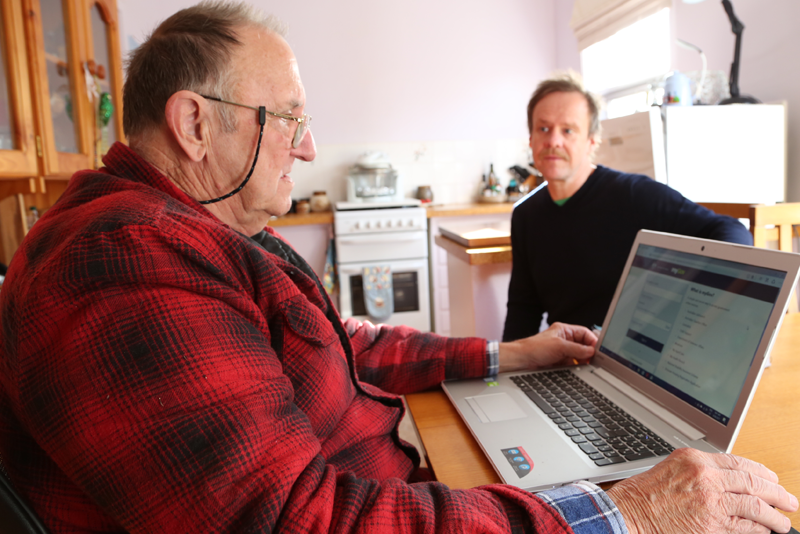 We talked to an elderly pensioner who works two days a week and reports their income through myGov. It’s an incredible privilege to hear people’s stories and I can’t help but feel for each and every one of them. As for the recent changes to myGov, the simpler design and navigation have made some difference for users. It’s less fancy, but it’s clear. You don’t have to spend ages figuring out where to go. Some people found it easier to see their messages and access linked services. And the changes to how myGov appears on a mobile phone or tablet also got a mention. One person told us they would go out to use a public computer for a bunch of services they and their family need. But it was a chore they dreaded because going out made them anxious. We saw relief when that person road tested myGov on their mobile phone. On the other hand, we also saw people become flustered as they tried to complete their task. This confirmed that there are more opportunities to make the service simple and easy to use. In digital services, the process of testing and improvement never ends and so the work on myGov continues. Individual stories have been adapted to protect personal information. Read our most popular blog on user research and why we say no to surveys and focus groups. You can also read about how we’ve partnered with the Department of Human Services for successive improvements to myGov. Digital teams in government should read our guidance on understanding user needs and user centred process in the digital service standard. Jo Hill is a Service Designer and User Researcher at the DTA.